Google has regularly sent me a card with $100 of free Google AdWords spend. I like it because it's DIRECT MAIL and proof that even the most advanced and famous companies recognize the power of a marketing tactic that started, according to legend, in the 13th Century. OK--let's take a look at the package. This box arrived by UPS...yes...Google uses direct mail. The goal here is to get business owners to use Google Places. I won't go into why but Google is really motivated to boost its Places product. Here's an article I found. There was a lot to like about this direct mail piece...unless you are Yellow Pages. Delivery. By UPS...you had to sign for it. Superb. Expensive...but impossible to ignore. Plus it came in a box the size of a small turkey. Again. How can you ignore that? Overall, I thought the body copy was a bit confusing. Google Places is a mystery to most business owners (as is all of SEO and AdWords) so I would have made it easier to understand. All graphic designers note: Google uses black type on a white background. Apple uses black type on a white background. Both companies measure response and make a lot of money. Offer...$100 in FREE Google ads. But what sort of ad?...thankfully there's a number to call. In fact, the CTA is to call. In a brochure within the folder, Google offers all sorts of "stuff" to get you to promote Google places...pens...fortune cookies...toothpicks...yes--toothpicks. Interesting headline..."You're already doing a great job. Make sure you get noticed." Hmmmm. Rookie direct response copywriting mistake: asking a question the reader might not know the answer to...ARE YOU EASY TO FIND ONLINE? In a time when companies rarely send large-scale big budget direct mail packages, this one was epic...although confusing. One final thought...it's cool that companies can add photos, videos, etc. to their Google Places page but I think it's a huge mistake to rely on user generated content, which is notoriously easy to rig. In fact, this line of copy reveals all..."Encourage customers to rate and review your business." I would have made this piece more educational. 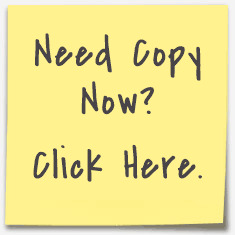 I'm a direct response copywriter and my site is here.